Baby bottles, which can potentially leach BPA are in contact with milk and other liquids that are consumed by infants. If the BPA gets into the liquid, it can get into the infant. And since infants consume quite a bit a liquid in such a manner during their first years of life, and since they are so small, the exposure levels could be a concern. Scientific findings strongly suggest otherwise, but at least in this case, you can still see a straightforward path between source and exposure. But compare that with receipts. The frequency of handling such receipts will be minimal, in many cases less than once a day (except for cashiers), the exposure period is for short time (until it is tossed or put in pocket) and the mass of the person is 10x to 30x larger, But more importantly, the receipts are handled by people's hands. Why did I emphasize hands? Because the skin on your hands is one of the least permeable areas on your body. I'm not sure if transdermal patches drove the research in the area, but regardless, the variation of skin absorption has been studied. The picture below summarizes the results "Source: Percutaneous Absorption: Drugs - Cosmetics - Mechanisms - Methodology" and is from Chapter 5. 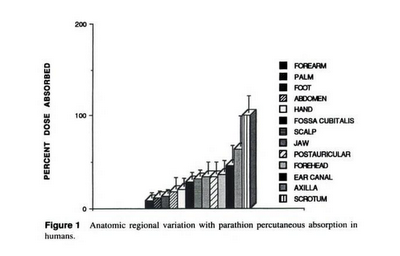 This spread is called "regional variation"  in percutaneous absorption. You'll notice that palms are very low on the list, with only the forearms being less absorbent . That the hands are so impermeable is something you probably already knew without necessarily being aware of it. For example, lots of people I know (including myself) have had poison ivy outbreaks all over their bodies, but never on their hands, even though hands are a very likely source for contacting the urushiol oils. As long as people aren't taking their receipts and rubbing them all over their bodies on a regular basis, I'm already very suspicious about being concerned with this exposure route, and banning the material in this application amounts to little more than political grandstanding. The chapter starts by noting that the first occupational illness ever identified was scrotal cancer in chimney sweeps. The sweeps were coated head to toe with soot, but since the scrotum is the most transmissive region of the body, that is where the cancers began. Why are the forearms so nonabsorbent? I can see (evolutionary) advantages in hands being nonabsorbent since we they are our primary means of interacting with the world, but why forearms?